No signs that we saw either outside of the church or leading to the cafeteria, although the fish fry was fairly easy to find just off of Lockwood Avenue. Ordering was straightforward. Actually, something new we hadn't seen before when ordering - they wrote our orders directly on the stryrofoam containers. About a 10 minute wait at 6pm. Speaking of styrofoam, the only plates were styrofoam take out containers. No visible recycling. Wow! What a change! 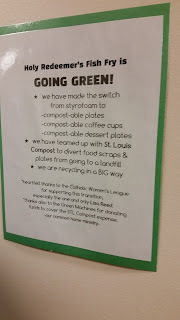 They not only have compostable containers, but they had two full time volunteers helping to make sure everything was recycled properly. Way to go! Signage and wayfinding improved greatly. Big signs out near Lockwood and nice thank you signs all over the inside. Cod was very good. A good, spicy kick to the breading, but not overwhelming. One of our friends had the baked Cod, and it looked good. Other options included a smoked salmon dinner. Kids meals included cheese pizza (Papa Johns) or fish fillet. Clam chowder was available. Sides included: slaw, green beans, macaroni and cheese, and french fries. Side were simple, but well done, my fries were large cut and crispy. Good selection of homemade desserts. Cod was still very good. Only downside, was that is wasn't piping hot. They fry somewhere else in the church and have to carry the fish into the serving area - and I don't think it was on warmers. Homemade desserts were still a highlight. Lots to choose from. I had red velvet. The fish tacos were good. My daughter had the shrimp tacos. Good to fair value. $29 for our family of five. 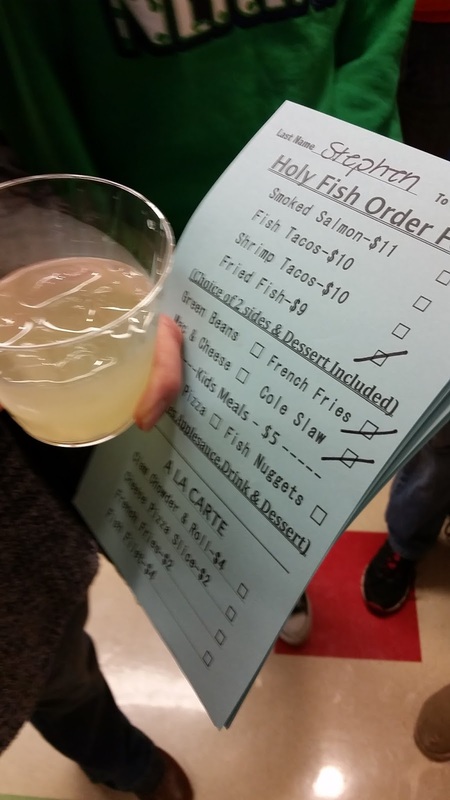 $8.50 for Cod Dinner, $10 for smoked salmon dinner, $3 for clam chowder. Dinners included two sides, dessert, and water/coffee (Starbucks!) Kids meals were $4 and included applesauce, drink (soda or juice box), and dessert. Soda $1 (maybe this wasn't included as part of the kids meal? a little confusing. If it wasn't, we owe you $3 Holy Redeemer and we're sorry!). Wine and Beer $2, Schafly/Fat Tire $3. I can no longer feed my family of 5 for under $30! Our total was $42. 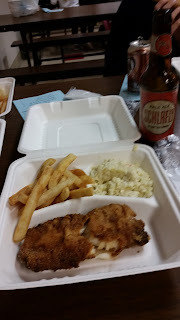 Cod Dinner was $9. Fish/Shrimp tacos were $10. Smoked salmon was $11. Margaritas now available for $5 for a small. A little tight on space. Everyone is squeezed into a small cafeteria and even tables in the hallway. Table were the bench, cafeteria style tables. But everything was brightly lit and a variety of art on the walls. If you don't mind being squeezed in, it was a good din of conversation. Many friendly volunteers (with matching aprons!) and kids busy clearing tables. We were asked a couple of times if we needed our plates (stryrofoam) cleared. Another unique feature was beer/wine sales, which was a gentleman carrying a cooler around his neck, working the crowd. Expanded seating in the gym made it less crowded. 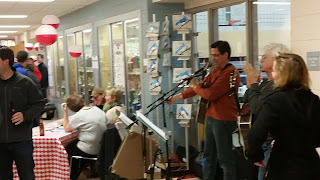 Plus live music! A trio entertained the crowd waiting in line with christian rock and other pop songs. It was great! Plus some nice decorations - what I thought were initially some strange chinese lanterns were actually fish bobber decorations. Nice touch! 3 out of 4. Remember when you was a kid 10 or 11, and you would spend time at your cool aunt's house. You would get pizza or takeout, soda, and get generally spoiled. In some ways, Holy Redeemer felt like this. The kids meals included Papa Johns pizza and soda. Starbucks coffee takeout containers for the adults. Doing things to keep it simple (like using takeout styrofoam containers for everyone). Overall an enjoyable fish fish. Just be prepared for a crowded cafeteria. Holy Redeemer doesn't have a fish fry every Friday, so check ahead. What was already a good fish fry has gotten a huge leap forward. The food was already solid, but the addition of live music, great wayfinding, and a strong recycling program has made it great. An easy 3.5 out of 4. We are raising the wayfinding/greening grade to 4 out of 4 and the atmosphere to 3 out of 4. Great job Holy Redeemer! 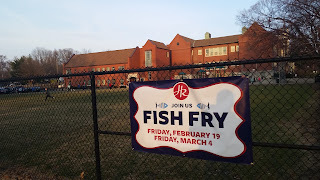 I think Holy Redeemer only has two fish fries per lent, so be sure to check their website for details and dates. Can you list this year's price? 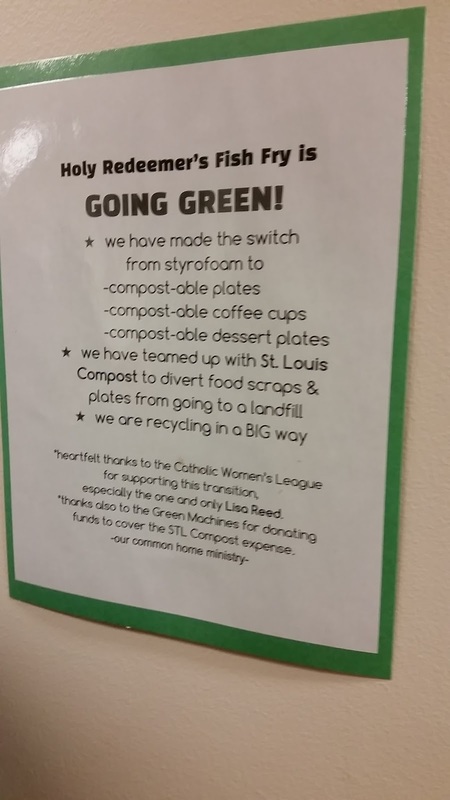 There was no link on their website nor any information on the parish website. Thanks so much. Sorry - We only update prices when we go back and visit (and even then we sometimes forget!) We don't even try to keep everything current - there's no way! We're just simple fish fry bloggers - use the information in context! (or just add 3.25% a year for inflation.